To Cite: Ghazipour A, Noori S M, Madjidi S, Nikakhlagh S, Saki N, et al. Determination of the Effect of Nasal Septoplasty on Pulmonary Artery Pressure in Patients with Deviated Nasal Septum, Jentashapir J Health Res. 2014 ; 5(4):e21890. doi: 10.17795/jjhr-21890. Background: Nasal septal deviation (NSD) can cause upper airway obstruction, which results in hypoxia and therefore, pulmonary vasoconstriction, ventricular hypertrophy and right-sided heart failure. Objectives: The aim of this study is to determine the mean pulmonary arterial pressure (mPAP) of the patients with NSD and the effect of septoplasty on pulmonary arterial pressure. Patients and Methods: Thirty five patients with NSD (mean age, 31.37 years; 19 men and 16 women) were included in the study. 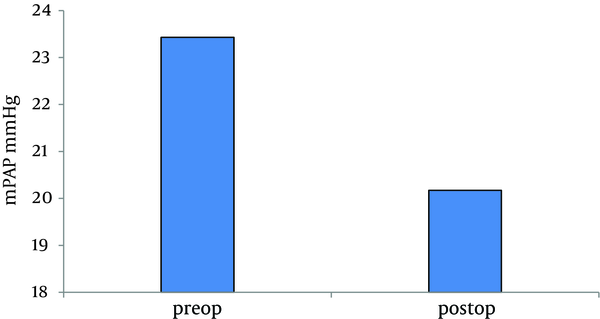 Mean pulmonary arterial pressure was measured in the preoperative period and after third month postsurgery. Results: The preoperative mPAP value (23.43 mmHg [SD, 3.84]) was higher than postoperative values (20.17 mmHg [SD, 3.36]). There was a significant decrease in mPAP after the surgery (3.26 mmHg). P-value in our study was smaller than 0.001. Conclusions: Nasal septal deviation like other causes of upper airway obstruction such as adenotonsillar hypertrophy affects mPAP. Nasal septoplasty is effective in reduction of mPAP in patients with NSD. Nasal septum is one of the factors influencing nasal function. About 75 to 90 percent of people in our society have some type of nasal deformity (1). There are many causes for nasal obstruction including the presence of tumors, infections, and nasal septal deviation (NSD), the last of which is one of the main causes for nasal obstruction (2). Approximately half of the resistance of nasal airways against air flow is due to the presence of the nose (3). The effects of NSD on the resistance of nasal airways are reduced following surgical correction. Considerable deviation of the nasal septum causes obstruction of the upper airways and, similar to extensive nasal polyposis and hypertrophy of adenoids, can cause chronic alveolar hypoventilation and cor pulmonale. Cases of cor pulmonale and significant increases in pulmonary hypertension leading to death have been reported (4, 5). The effects of chronic obstructive disorders of the upper airways such as tonsillar and adenoid hypertrophy and extensive nasal polyposis on the cardiopulmonary system have been studied (6-8). However, the effects of NSD on the cardiopulmonary system have not been thoroughly investigated. In a study conducted in Mashhad, the effects of adenotonsillectomy on reducing pulmonary artery pressure were studied and it was shown that mean pulmonary arterial pressure (mPAP) decreased by 1.27 mmHg after the adenotonsillectomy (9). It has also been shown that adenotonsillectomy in children with adenotonsillar hypertrophy shows improvement of the function of the right ventricle and reduces mPAP (10). Moreover, in all patients with adenotonsillar hypertrophy, who had a history of pulmonary hypertension, pulmonary artery pressure was normalized after adenotonsillectomy (11). Since there is no definite medical treatment for pulmonary hypertension, NSD surgical correction may be used as an optional treatment for increased pulmonary artery pressure. In this study, statistical analyses were performed using the SPSS version 17.0, and paired T-test was employed for comparisons. The research included 35 patients with NSD who admitted to the ear, throat, and nose clinic of the Imam Khomeini Hospital of Ahvaz from May 2011 till February 2012, and diagnosed. Clinical examinations and CT scans showed no other causes for airway obstruction other than NSD. Nasal septoplasty was performed with the help of Killian incision or hemitransfixation. Color Doppler echocardiography (General Electric, Wauwatosa, WI Vivid3) was carried out on all patients before operation and three months later, mPAP was measured. Septoplasty was performed under general anesthesia on all patients. Three months after the operations, the same cardiologist measured the mPAP of the patients using the same echocardiography machine. Written consent to take part in the study was obtained from all patients. Thirty-five patients took part in the study, 19 of whom (54.3%) were men and 16 (45.7%) were women. The mean age of the patients was 31.37 years. The minimum mPAP measured prior to the operations was 9 mmHg and the maximum was 28 mmHg. The largest decrease in mPAP was 6 mmHg, which was observed in three men. Before the operations, the mean mPAP of the patients was 23.43 mmHg. After the operations, the mean mPAP of the patients dropped to 20.17 mmHg (Table 1), which showed a decline of 3.25 mmHg (Figure 1). P-value in our study was lesser than 0.001. 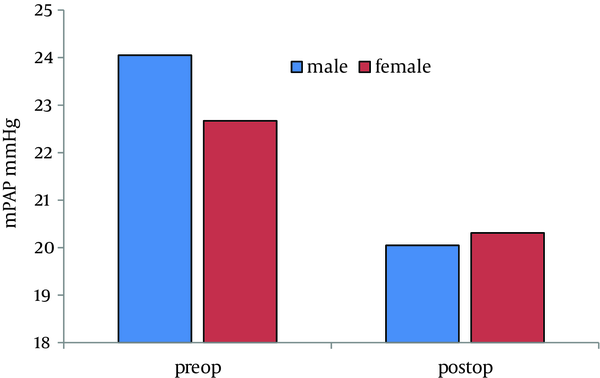 As seen in Figure 2, pulmonary artery pressure before septoplasty was higher in men compared to women, and it falls after the septoplasty. The fall was greater in men as compared with women: 4 mmHg in men versus 2.37 mmHg in women. Factors causing obstruction of the upper respiratory system increase mPAP and, hence, lead to pulmonary hypertension and cor pulmonale (6, 12, 13). mPAP greater than 25 mmHg is considered to be abnormal. Most studies carried out so far have been on adenotonsillar hypertrophy. Nasal obstruction disrupts the physiological ventilation of the lungs, because it obstructs the passage of air flow. Since the passage of air through the nose is obstructed, breathing is done through the mouth, which increases the resistance of the upper respiratory system. Breathing through the mouth causes turbulence in the air flow and, therefore, in a supine position, the air pressure inside the airway may not reach the levels required to keep the oropharyngeal airway open. As a result, the tongue remains in the back and closes the airway. The CO2 entrapment, together with alveolar hypoventilation, may play a major role in causing cor pulmonale. In available literature, there are reports of increased pulmonary artery pressure after hypoxia related to pulmonary vasoconstriction resulting in ventricular hypertrophy due to excessive load on the right ventricle of the heart and right-sided heart failure (5, 14). Moreover, hypoxia plays known roles in the cardio-pulmonary system such as increasing capillary permeability and causing pulmonary edema. Thickening of the muscular layer of small arteries, and of pulmonary arterioles, result in pulmonary hypertension. Cardiopulmonary functional reserve in nasal septal deviation has not been studied. Doppler echocardiography is an established, cheap, and non-invasive method used in the evaluation of such cases, and is, most often, available. Other factors resulting in chronic obstruction of the upper respiratory system such as adenotonsillar hypertrophy have already been studied. In cases of adenotonsillar hypertrophy, reduction in pulmonary artery pressure was observed after adenotonsillectomy (7, 14, 15). In our study, the mPAP of patients with NSDbefore the septoplasty operation was higher than the mPAP observed three months after the operation. One study in children showed that other pathologies causing chronic obstruction of the upper respiratory system (such as adenotonsillar hypertrophy) result in pulmonary hypertension, while adenotonsillectomy reduces mPAP, improves pulmonary function test results, and O2 saturation (7). When the preoperative and postoperative results were compared, it was found that there was a statistically significant decrease in mPAP in 52 children (preoperative mPAP = 23.13 ± 7.68, postoperative mean PAP = 17.00 ± 6.99 - paired sample t test, P < 0.05). Twenty-seven out of the 52 subjects in the study group were pulmonary hypertensive preoperatively. mPAPs of 18 of these children decreased to normal range, and this was also found statistically significant (McNemar test, P < 0.001) (7). Considering these results, it can be concluded that eliminating factors causing obstruction of the upper respiratory system can somewhat reverse changes leading in pulmonary arterial hypertension. Results of our study show that nasal septoplasty can cause a reduction in mPAP by correcting nasal deviation. Of course, this reduction is more prominent in men compared with women (4 mmHg in men versus 2.37 mmHg in women). Mean pulmonary artery pressure in people with nasal septal deviation is reduced after septoplasty operations. Therefore, in patients with pulmonary hypertension, who simultaneously NSD, pulmonary artery pressure can somewhat be reduced by performing nasal septoplasty, which is a common surgical operation performed by ear, nose, and throat specialists. It may be possible to prevent, or even reverse cardio-pulmonary complications by nasal septoplasty. The authors would like to thank the research deputy for their valuable cooperation. This article was based on the findings of an ENT Specialist thesis No. 656/d, Ahvaz Jundishapur University of Medical Sciences. Financial Disclosure: The expense of this thesis has been provided by the credit of the approved research project no u - 91077and All right of this thesis is reserved for Ahwaz Jondishapur University of Medical Sciences. Funding/Support: Ahavz Jundishapur University of Medical Sciences.